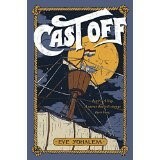 Very feline hijinks are the theme of this recently-translated and great fantasy. Winner of the Hans Christian Andersen Award, Annie M.G. Schmidt died in 1995. Her books are loved throughout Europe, but especially in her home, the Netherlands. This translation stands as a delightful addition to children’s literature available in the USA. Minou is very cattish, but she doesn’t look like a cat. And she’s not sure why. She climbs a tree when a dog chases her, and thus begins her association with Tibble, a reporter with the Killenthorn Courier and sometimes rescuer of cats in trees. Killenthorn is full of cats, and Minou finds she is able to communicate with all of them. She helps Tibble gather news and keep his job at the paper. His editor hates cat stories, but they’re able to give him news about humans from what they overhear. Mr. Ellmore is a businessman who has the entire town convinced he is a nice, compassionate man, but he’s really very nasty. Plus, he owns the meanest dog in town. Through Minou’s efforts, Tibble is able to expose Ellmore. The reader also finds out how Minou ended up in her predicament and can cheer for her to find peace in her life. 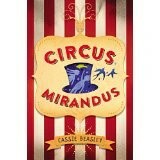 Fifth graders will enjoy the gentle humor and ridiculous situations. Meanwhile, they’ll learn about a slightly different culture and definitely a different fantasy world. If a book could talk, what would it say about its past? It would tell you about the farmers of Mesopotamia doodling with sticks on clay, but even before that type of writing, story was told with breath. This fun look at the development of the book is entertaining as well as educational. Teachers and librarians will use it to fulfill core curriculum standards in areas of history and several literacy skills. 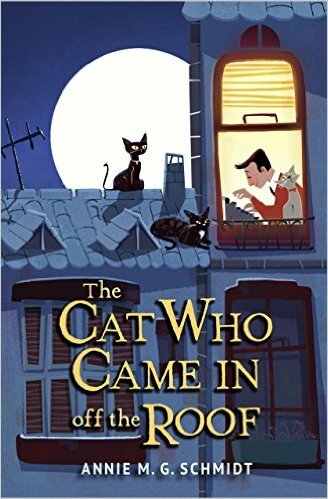 Young readers will need to be prepared for how the author uses the inanimate book to tell the story in words normally used by people. A fun activity to engage in while reading this book aloud to a class would be the creation of a time line illustrating each evolution of print. Students can discuss their opinions of digital versus print books when they come to the section in this text where we are assured that story will always be present. The inclusion of poems, and quotes from around the world about the importance of books to the world add depth and beauty. Students who become interested in the development of the book will want to research beyond this simple, but fun introduction. “Why can’t I go to college, too?” A heartfelt question asked by many a girl at the turn of the century when she first realized only the brothers would get the education they desired. 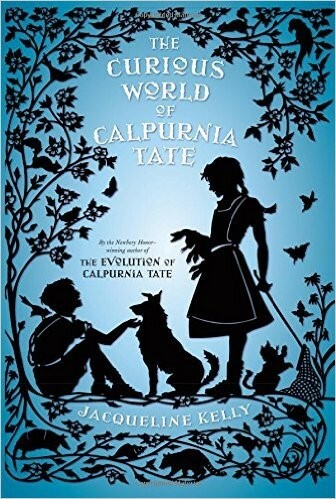 We first met the vivacious and wonderful, Calpurnia Tate, in Jacqueline Kelly’s Newberry Honor Book, The Evolution of Calpurnia Tate. Now her story continues into the season of spring with many new science experiments with Grandfather, sibling fights with all those brothers and facing a world trying to put her into a “homemaker” box. Kelly builds the realistic plot with impeccable research from both time and place. Readers learn of the devastation of the Galveston hurricane of 1900, the tragedy it caused for family members far away as many hurried to help. The character development is spot on as Callie relates to each of her brother’s whims. She is always helping out Travis with whatever new animal he has brought home to rescue. Worry, humor and resourcefulness are often involved in taking care of these animals. Teachers and librarians will fulfill many core curriculum standards in literature, history, geography and science using this text. Many will want to introduce it in read aloud time. Parents would find this a great gift giving book. Both of these books should be in every school and public library. Grade four, grade five and grade six readers as well as those far beyond will begin this book and keep turning pages for hours without stopping. When it does end, they will be sad to part with these great new friends in this wonderful new place. And then what will we do? Wait impatiently while hoping Jacqueline Kelly is writing the next book about Calpurnia and her family. 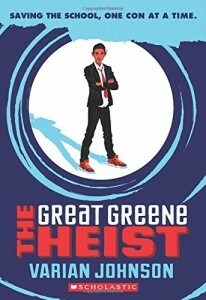 Jackson Greene, middle schooler, is way too smart for his own good. He’s a budding con man who rarely gets caught, but he does take big risks. Then again, his heart is in the right place. The one time he did get caught earned him a bad reputation with the principal and alienated the love of his life, Gaby. When Gaby ends up running for student body president against Jackson’s sworn enemy and cheater, Keith, Jackson decides to help Gaby. Without her knowledge. Jackson and Gaby’s twin brother, Charlie, devise an elaborate plan, partly Star Trek and partly Ocean’s Eleven inspired, to make sure Keith doesn’t steal the election. With a few surprises, the team, sometimes referred to as Gang Greene, get the job done. Kids, especially middle schoolers, will love the hilarious adventure and recognize people they know in the characters. From the geeks and nerds who speak Klingon to the jocks and rich kids who feel entitled. Teachers and parents will like the fact that each transgression carries consequences. This is a chance for kids to practice their literacy skills while being entertained. 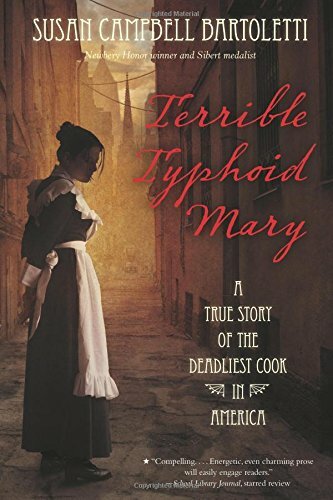 Mary was a great cook, but she was a carrier of the deadly typhoid disease. It was likely she unknowingly put germs in food of people who later became very ill and died. But Mary never understood what it meant to be a carrier and couldn’t accept help from the medical community. They were trying to save the people of New York City. Once again, Susan Campbell Bartoletti has done extensive primary and secondary source research in support of the story. 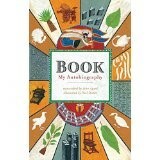 This biography is filled with details and each one is verified by its source. Readers get a glimpse of the frustration felt by Mary, but then in later chapters can relate to the frustration of the health officials. They really weren’t targeting Mary, but trying to do what was best for everyone. Students will learn about this particular event and also how to do a solid, non-fiction report of their own. Core curriculum standards in literacy, as well as American history and health/science can be fulfilled. Among the story of what happened to Mary, readers will notice a story of how the science of health was developing in this era. Anyone involved in women’s studies might also find it interesting that even while Mary was quarantined, several men also identified as carriers were treated and/or observed, but never quarantined on a far away island. 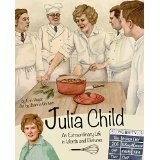 Julia Child was passionate and friendly, as is this new biography about her life and work. The text is conversational as well as informative. Like many grown-ups, even Julia Child sometimes wondered what her real life’s work might turn out to be as she moved all over the world. Finally, one day while having lunch in a restaurant in Paris, France stirred up her passion for good food. Grade three readers, or grade six readers and any others who pick up this biography will be amazed at how this girl from Pasadena, California grows up to become one of the most successful and famous chefs in history. Her cookbooks and television shows were followed by thousands. People still roast a chicken the same way Julia taught them, all while laughing and visiting with them and the TV filming crew. Each chapter includes several full-page sketches depicting various events of Julia’s life. Readers will love how these sketches help transport them into her world. Teachers, librarians, and parents will applaud how much this book can be a comfortable read, and also provide a bridge to research-based reading and writing. It fulfills many core curriculum standards in the areas of literacy, geography, history and culture. Students can use the index, glossary, bibliography and timeline while completing their own research into the life of this famous woman. 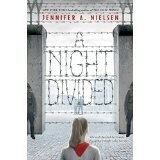 This would be a great addition to any upper elementary or middle school, and public library collection. Also, a fun birthday or Christmas surprise for any third to seventh grader who loves to read and cook. Extras: Glossary, Index, Time-line, Bibliography, Illustrations of Julia Child Historic Kitchen in Washington, D. C.
Well, at least I think this is fiction, but the author seems to have an awfully firm grasp of middle school and all the nuances of life there. Young Max Corrigan has taken it upon himself to help new students adjust to life in William H. Taft Middle School. He’s even devised a packet illustrating his methods and appointed himself head of the welcoming committee. 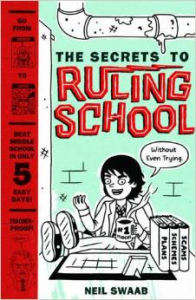 After Max introduces himself to the new student, he outlines the plan, which consists of trying to fit into many of the known cliques in the school. He begins by teaching him to use humor to try and fit in with the Class Clowns. He then moves on to how to look like an Artist, what Band Geeks are really like, fitting in at lunch, how to deal with the principal, and how to talk to Preps. On the second day, he learns how to raise money and how to avoid the Jocks and the Tough Kids. By Wednesday, the new kid is in trouble and needs advice on how to lie effectively. Much of Thursday is spent trying to hack into phones and learning to ditch class. By Friday, the new kid and Max are the heroes of the school and can go to the Saturday birthday party in style. Swaab is an excellent illustrator and that is a major strength of this book. Crowd scenes are especially entertaining – in a “Where’s Waldo” sort of way. With the right approach, this book can be very humorous and stress-relieving for fifth graders about to enter a new world. Teachers and parents need to be aware of some of the more subversive elements, though, such as the recipe for fake vomit. Mutiny aboard ship, would you be with the captain or against? Petra and Bram would each have to decide. They didn’t care about the gold the mutineers were stealing from the hold. They were each trying to find a place and way to live free from danger in the world. Petra’s father would likely kill her if she were forced to return to Amsterdam. Bram would never find a place he truly belonged in the world because of being a mixed race boy. This story of life aboard the ship, The Golden Lion, in the year 1663 is a fast paced tale of pretending to be a boy while surviving a long journey at sea. It involves bad weather, an attack by pirates and mutiny at sea. The diagram of a ship of this sort is accurate. Much research went into writing this book with as much accuracy as possible. The author’s note explains the amount of research, but it would have been helpful, from an educational viewpoint, to have included some of the sources. The book will still fulfill literacy requirements, as well as, core curriculum standards for geography, history. The world map showing the journey is great, but an added timeline as to how this story fits into world history would be a good thing to have students create as they enjoy this exciting swashbuckling adventure. Grade four, grade five and grade six readers will enjoy reading this ocean journey late into the night, maybe with a flashlight under the covers!